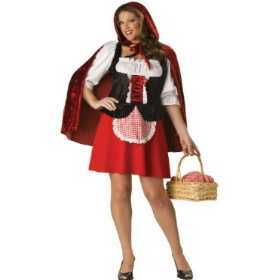 The following women’s Halloween costume ideas are all available as ready made outfits from Amazon.com – just click on the image to see product details or to order. However, if you’d like to make a homemade version of these Halloween costumes, just check out the how-to suggestions at right – many of the necessary items are things you may already have, while others are easy to find at thrift stores. It annoys me that so many women’s Halloween costumes are designed for someone the size of a stick insect, so I’ve included costumes here that will work for almost anyone. Now you can be the fairest of them all in this officially licensed Disney Snow White costume. Includes dress with high collar, trim, sheer overlay and headband with bow. Women up to Size 14. It’s doubtful that you’ll find a yellow dress with blue bodice in the thrift store – but how about a yellow skirt, long or short, with a blue blouse? Make a cape from a yard of shiny red fabric and add a matching red bow for your hair. Remember, it’s the combination of yellow, blue and red that will pull your Snow White outfit together. Red nylon devil’s costume with wide ragged sleeves and ragged hem. Horns and pitchfork not included. Think fiery red when making this outfit – from a red fleece tracksuit to a red mini skirt and bustier – almost any red combination will do, providing you add the all important red devil horns and a red devil tail. Both these are widely available and fairly cheap to buy in most department stores at Halloween. If you like, you could add a red devil’s pitchfork as well. Become the cute and mischievous rag doll. 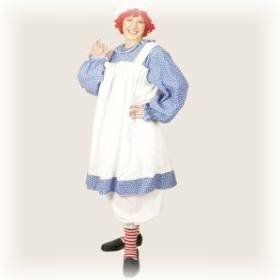 Official Raggedy Ann costume includes blue with white polka-dot dress and white apron, bloomers, red and white striped socks and a one piece cap and wig. Fits ladies up to size 18.
for this, along with red hair. Make a yarn wig by centering lengths of red, craft-weight yarn across a sheet of paper and machine-sew down the middle; tear off paper when done. Other embellishments for Raggedy Anne (apart from Raggedy Andy to hold hands with) are bright red lips and red blush cheeks. If you don’t have a lacy petticoat, glue or sew cotton eyelet lace under the skirt hem – or fashion a pair of white bloomers instead. Add an apron, and you’re ready to play! Includes corset dress and headpiece in gold, brown and cream, in Women’s Plus Sizes. Long Dress with satin cups, back neck velcro tab, pleather shoulders and corset waist, rope lacing on corset and waist back ties and elastic back waist. is essential to pull off this viking warrior look; either purchased or easily made by attaching painted cardboard horns to a circlet or ready-made hat. Golden braids (of yarn or fake hair) are optional. A long dress, cinched at the waist with a suede or pleather over-corset, becomes striking Viking apparel by adding faux animal fur around the collar, hem or sleeves. Finally, carry a sword, pike or small axe. Three-piece Egyptian Halloween Costume comes with an ankle-length white dress featuring gold detail with designs at the hem of the sleeves. The costume also comes with a headpiece and an Egyptian collar. for ideas on how to dress as Cleopatra – a gold belt, either around the waist, or under the bust, is essential, as well as a wide, circular collar, preferably detailed with gold, easily added as a separate piece over the top of the dress. A gold headband (or circlet around the forehead), gold shoes, and lots of gold bangles on the arms complete our Eygptian queen. 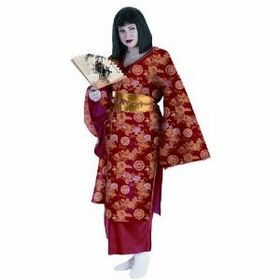 Ladies geisha outfit features a kimono and obi (belt) with a slip dress underneath, accessorized with a paper fan and black wig. Apart from that, head to the thrift store for a colorful silk dressing gown with wide sleeves and a straight silk underskirt. Cinch the gown with a wide, homemade obi (a cumberbund-style belt) around your waist, trimmed with a large fabric bow, with long trailing ends, tied at the back. Carry a paper fan or traditional Japanese parasol.
. Those of you with basic sewing skills can make your own from a yard or two of red fabric. Wear the cape over a red dress, or red skirt and white blouse. Add an optional vest, in black or white, and carry a basket of goodies for grandma. Watch out for the big bad wolf!